The Maritime Museum of the Atlantic’s 2017 special exhibit, Collision in the Narrows: The 1917 Halifax Harbour Explosion commemorates the 100th anniversary of this fateful event. The museum’s permanent Explosion exhibit, Halifax Wrecked, shows what the Explosion did. The special exhibit investigates what it means, for those who suffered it, and for the world today. 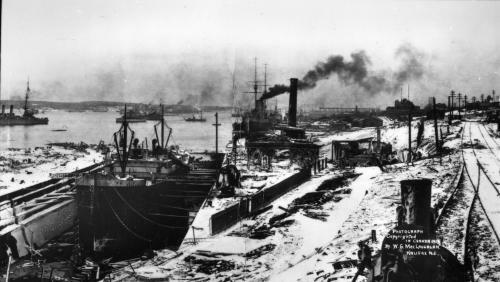 It examines the Explosion through three cultural movements that converged in The Narrows of Halifax Harbour on December 6, 1917: a deeply rooted indigenous culture, a global maritime culture, and a Canadian national culture. 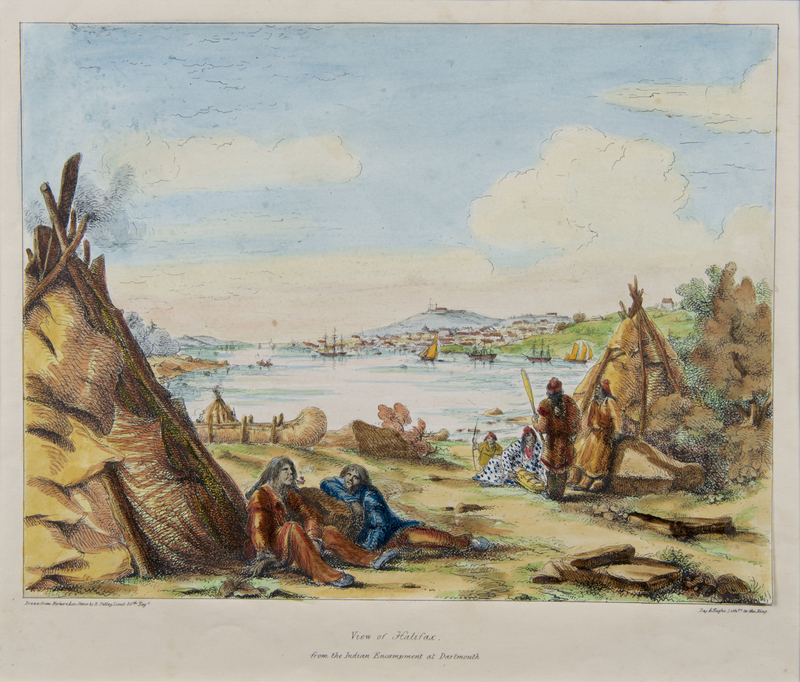 The exhibit approaches indigenous communities struck by the blast in the context of an enduring maritime cultural landscape stretching from The Narrows deep into Mi’kma’ki—the place of the Mi’kmaq. Appreciating the antiquity and refinement of the culture nourished by this landscape, it tracks challenges and opportunities faced in the years and centuries before December 1917. For over 250 years, The Narrows was dominated by naval power. Colonial and Canadian Halifax played an important part in circuits of trade and warfare that defined the modern world. During the First World War, these links opened the city to cosmopolitan influences but also placed it on the front lines of global conflict, with devastating consequences. The Narrows was shaped by rail lines stretching from deep-water shipping piers far into the continent, to the cities of central Canada and the wheat farms of the Prairies. 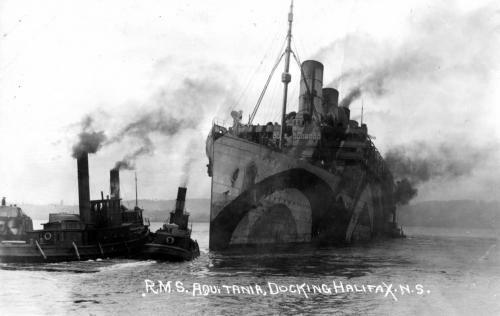 Invigorated by war, Halifax earned its status as Canada’s Atlantic Gateway. Residents of the north-end Halifax districts Richmond and Africville relied on the railway, the factories, the waterfront; on December 6, 1917, they payed a terrible price for this reliance. 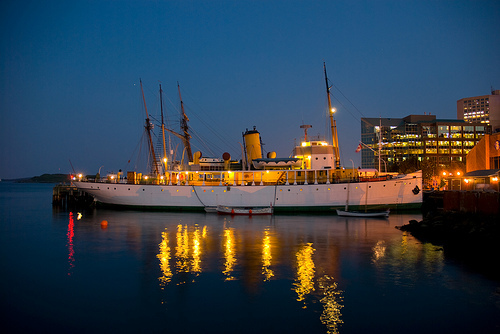 To mark the 100th anniversary of the Grand Old Lady, we'll be offering a number of special events over the Natal Day Weekend (August 3rd through 5th) You're welcome to come and visit the old girl. Admission to the ship will be free all weekend. Roald Amundsen's Reflection's from the Northwest Passage. While he is best known as the man who led the first successful assault on the South Pole, Roald Amundsen was also the first person to navigate the Northwest Passage, using the research vessel Gjoa Haven. This temporary exhibit, courtesy of the Royal Norwegian Embassy provides a fascinating glimpse into Amundsen's passion for the frozen vistas of the Canadian Arctic and features stunning large scale reproductions of the magic lantern slides that Amundsen had taken during the 1905 trek through the Northwest Passage.